Interview with Adrian Mayes, narrator of CHEERLEADERS FROM PLANET X! It’s been a busy month for me! This last weekend I attended Portland Book Festival, my first real author event! I was at the Snowy Wings Publishing booth along with fellow author T. Damon, signing and selling books. It was a lot of fun and I hope to be able to go again next year! I posted a few pictures from the event on Instagram, if you’d like to see them. 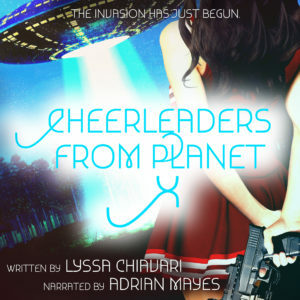 In the meantime, the Cheerleaders from Planet X audiobook has been available for a few months now, and I was able to have a chat with the narrator, Adrian Mayes! Adrian is a fantastic voice actor that perfectly embodied my heroine Laura. Thanks for doing this interview with me, Adrian! Q: How long have you been narrating/voice acting? What got you interested in the profession? A: I’ve been doing work in this field for about 4 years now? Since early 2014. I’ve always been interested in performing. I did ballet as a young child and moved into theater for my pre-teen/teenage years. I fell out of being onstage and was in a dark place for a while, I threw myself into video games during that time and I think something clicked during that period. I realized that there were people bringing these characters to life and that I could do that too. So I started learning how to practice and work on this from home. Q: What is your favorite genre to narrate? A: I’m still a bit new to narration work in general, but I think both fantasy and sci-fi fiction are my favorite in general. Q: If you could narrate any audiobook, what would it be? A: Hmm… I can’t think of any book in particular, but I think anything that’s really far from “daily life” would be really fun. Q: Are you working on any interesting projects right now? A: I actually just took over a role on an original animated project! It’s a sci-fi mech series that the creator has been working on this for years now and I’m so excited to help him on this! The series is called Shattered Heaven, and you can learn more here. Q: Where can people follow you online? A: I’m most active on my Twitter! Sign up for my newsletter to be the first to know when I have a new release!